Dallying In The Dirt, Issue #223--- A magnificent Thistle has graced the garden. “Dallying” didn’t get lost in cyberspace last week, it didn’t get written. Wonderful family things took precedent. The Assistant Gardener and I have five children and they were all together for the first time in about 7 years and that was a 3 day party celebrating Matilda’s homecoming and that led up to Father’s day and here it is the following week. My next project is to build an Ark. I should never have installed the drip irrigation system in the veggie garden. It hasn’t stopped raining since. That’s not totally true but it seems like it. Last night we were “blessed” with another 6.3 cm (2.5") and I need to get the canoe out of the garage to get to the back of the garden. 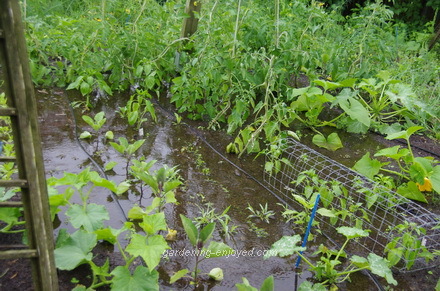 Many things have been beaten down by the repeated storms and the Tomatoes and Peppers at the bottom of the garden are practicing Hydroponic gardening. Hopefully most things will recover and even thrive on this excess of water. I planted a group of Earth Box containers this year to see if the continuous water and fertilizer they supply would solve some of my veggie garden problems. They have a habit of making me look a bit silly. Their soil is covered with a plastic top and therefore I will have to wade through the puddles tomorrow to bring them some water. The cloudy skies and excess moisture does have some benefits. My tree Rose is magnificent although a bit droopy from the weight of the water. 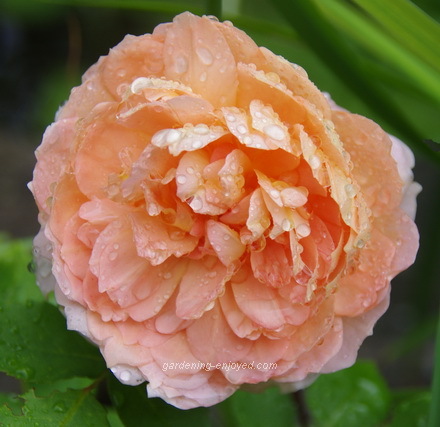 Carding Mill is a delightful David Austin Rose that is nodding a bit from the weight of the water but the conditions make for an excellent photograph. I had some trouble with my Austin roses for a few years. They grew thin and weak, especially after the first blooms. When I asked the folks at Austin’s what the trouble was, they asked me what I was fertilizing them with. My response indicated that I really wasn’t fertilizing them very much at all and that response elicited a knowing smile. Much better performance now that I’ve decided to start feeding them. They do like the large quantities of rain and hopefully it will dry up soon and I will be able to wander the garden and admire them. This is their prime blooming season. Unexpected things always appear in the garden, some delightful and some not and the odd thing that I really didn’t want but turns out to look great anyway. Tucked behind a Ninebark shrub in the top corner of the veggie garden a thistle seed got a good start. 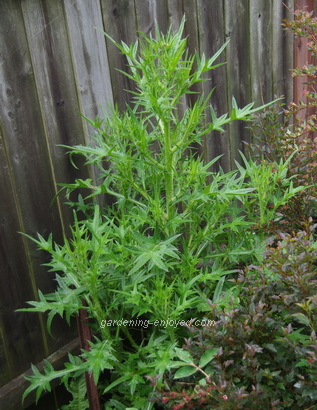 I don’t usually encourage thistles to grow in the garden. The massive water supply has been good to this thistle and it is no longer hidden behind that shrub. It is about 1.3 m (5') tall at this point and growing more every day. It is really quite magnificent and it will be allowed to stay so that we can admire it. It should produce some interesting purple blooms which we will watch closely. Any hint of seed production and it will be “off with their heads.” Every year in the garden, and there have been a few, shows me something new and I marvel at the wonder and diversity of what Mother Nature can do. I try to help her each year and sometimes she seems to appreciate my help and sometimes she reminds me that I’m really quite unnecessary. Patricia Asks? Do you have any suggestions on how to get rid of goutweed? Every spring I dig out as much of them as I can but they keep coming back since they have such an extensive root system! Now they are really getting into my perennials which I don't want to destroy. And also, what about dog strangling vine? I have tried pulling each plant out but often can't get the whole root. I always try to remove all the flower heads before they go to seed. Every bit of them that I remove I place in a black garbage bag and leave the bag to bake in the sun for a few days before disposing of them in the garbage. Ken Answers! If you have both of these pests then moving might be the easy answer :-) Continuing to dig is the most reliable method especially with Dog Strangling as it seems to seed more then spreading by underground parts. Keeping an eye out for any growth and hoeing it down before the leaves have a chance to feed the roots should eventually kill it. My neighbor's Goutweed continues to come over and visit. Carol Asks? I have a honeysuckle vine, I noticed some flowers looked deformed then saw tiny bugs that I thought were green seeds, but as I looked closer they were moving, I sprayed the whole vine with insecticidal soap... Will it work? Ken Answers! Insecticidal soap will work well on most insects and you appear to be describing aphids which are killed by the soap. The trick is to spray them frequently. The soap will only kill on contact, having no residual properties. The eggs that hatch 10 minutes after you spray will not be affected so you must spray again before they are old enough to lay eggs of their own. 2 to 3 times a week for a couple of weeks should solve the problem. Beverly In past years we have always had abundant blooms on our cherry tree in the spring and then plenty of cherries afterwards. However, this spring our tree was very sparse of blooms and many branches were bare. We did cut off what looked like dead branches after the blooming period. Our question; what is going on with our tree and if we can do something to correct this behavior? We do love our cherry tree. Ken Answers! I suspect the very cold winter. Cherry trees are near the edge of their hardiness in Oshawa. They produce flower buds in the fall and carry them all winter and they probably succumbed to the cold. If you pruned off the dead and we have a reasonable winter this year you should be able to continue to appreciate your cherry trees.